Do you remember this blanket? If not I don't blame you, it has been a long time between updates! 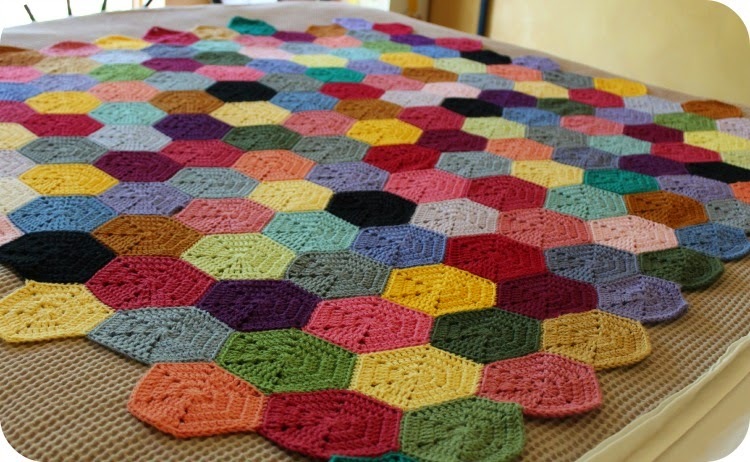 I started this Crochet Hexagon Blanket in January last year, it was my 2014 mood blanket. I guess its just my Crochet hexagon blanket now. The only mood that ever really governed it was what colour I felt like using at any given time. I didn't assign a colour to an emotion as many of the 2014 participants did, so it wasn't ever technically a mood blanket, in the strictest sense. Its only slightly bigger than it was in my last update, has been set aside for quite a while. I've taken quite a long break from working with yarn. I think the onset of the warmer days, arrival of the Puppy and consideration of my priorities drastically reduced the amount of time I was spending with my hook ... until it petered away to none. 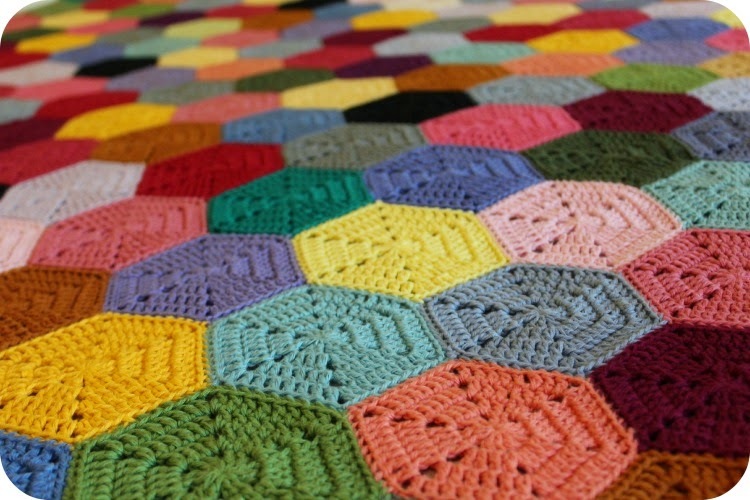 As a part of the de-clutter/Clean/Organise process I've undertaken in recent weeks, I looked at the little pile of hexagons I'd sporadically worked up and decided to attach what I had to the existing blanket, that would, after all be putting them away. Ah the therapeutic experience of working the needle and thread through the back loops in seaming, Oh! the rhythmic repetition of hook in hand ... My friends, I've missed you and the relaxing sense of purpose you bring.